As far as chefs goes, Ben Spalding is not not a newcomer to the culinary scene. 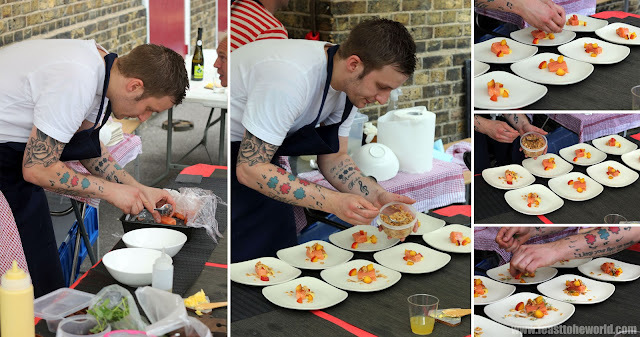 He had spent the last 10 years or so working in some of the world renowned Michelin-starred restaurants including The Fat Duck, L'Autre Pied etc, most recently as the Head Chef in Roganic. Since his departure, he had done a few pop up Sunday Roast events and now this is his latest project - Stripped Back. Occupying a small corner of London Field's Primary School playground in East London, right next to the famous Broadway Market, is this unassuming little venture of his. The idea is to bring Michelin quality food to the masses in a friendly and laid back surrounding. With only a capacity of roughly 8 covers and on a first come first serve, no reservation basis, this is definitely a cosy seating and not without its merits. Due to small volume of diners, both Ben and his amiable sidekick sous chef, Steve were able to pay full attention to all the dining guests throughout the meal, with occasional humorous conversation repertoire and comprehensive descriptions on all the dishes served. This personal and friendly service from the chef is a far cry from any snooty fine dining restaurants. On the day we went, he extended the seating to 10 by setting up two ladies onto the side table whom they paid equal attention to. 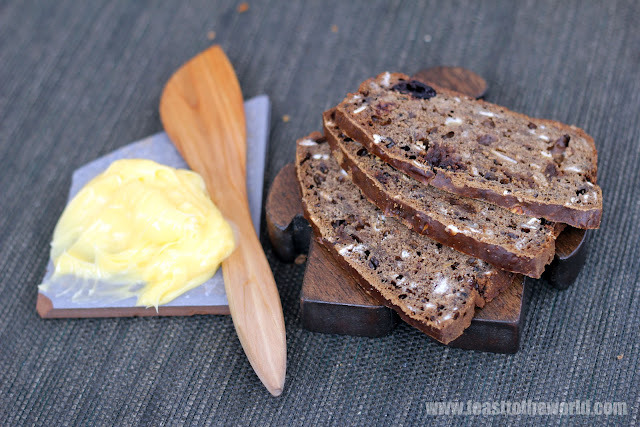 We were first offered slices of yogurt, muesli and malt bread which was mildly sweet and tangy alongside some bright yellow Jersey butter. 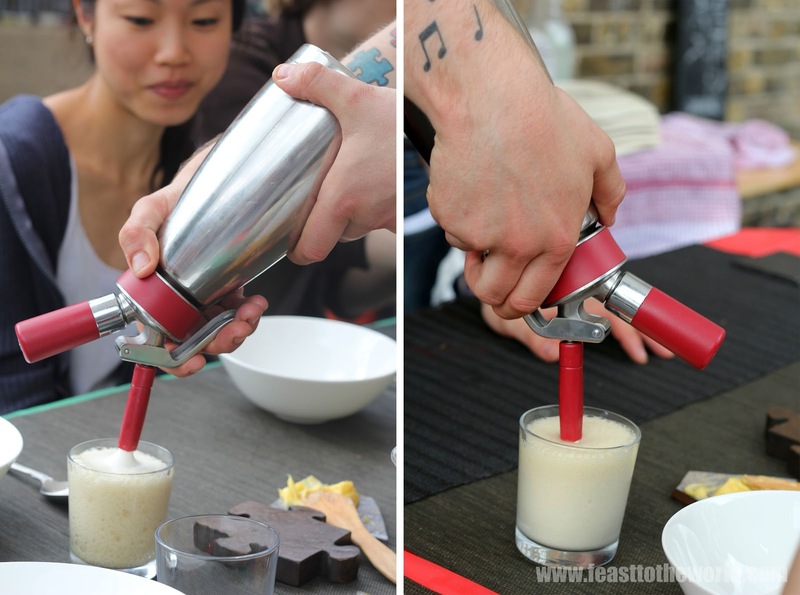 Along with this, we were presented with glasses of refreshing fizzy drinks made with meadowsweet and New Zealand's 42ºC below vodka. 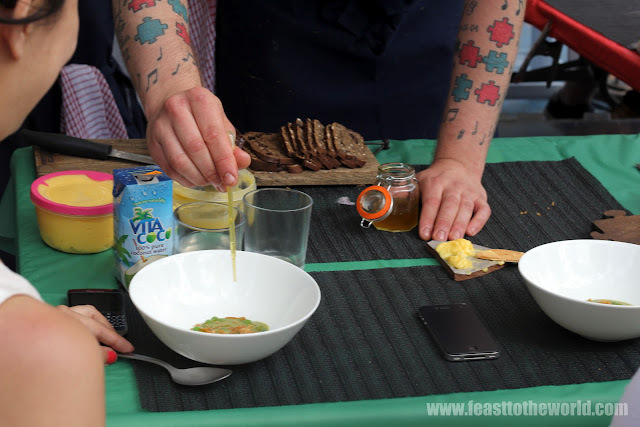 The first course was then meticulously assembled before our very eyes (the perks of having an open kitchen), first the dried cherry tomatoes, then some toasted macadamia nuts and green beans and peas; followed by a squirt of the thick, chilled pea and mint sauce soup. 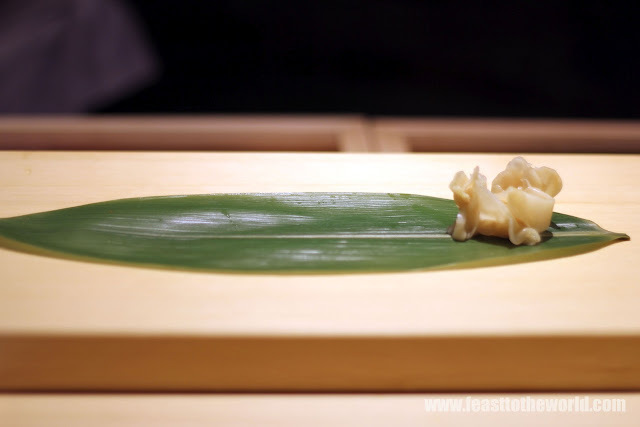 Finishing lastly with the delicate drops of the mugwort oil and the pièce de résistance - greasy chicken skin. Packed with intense flavours, with the odd contrasting burst of juicy sweetness from the tomatoes and the nutty crunch courtesy of the nuts proved both beguiling and addictive. 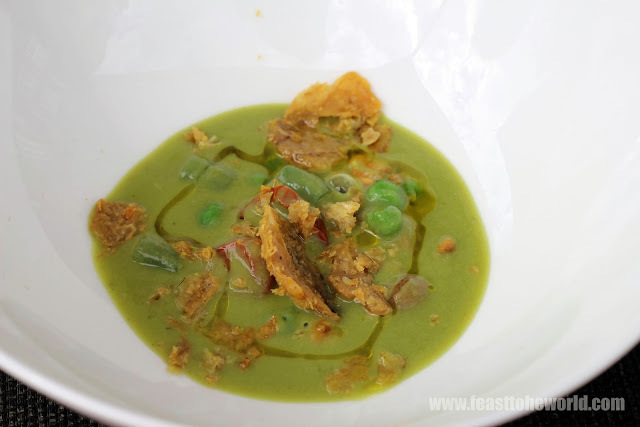 The addition of the crispy skin further add to this cornucopia of flavours. 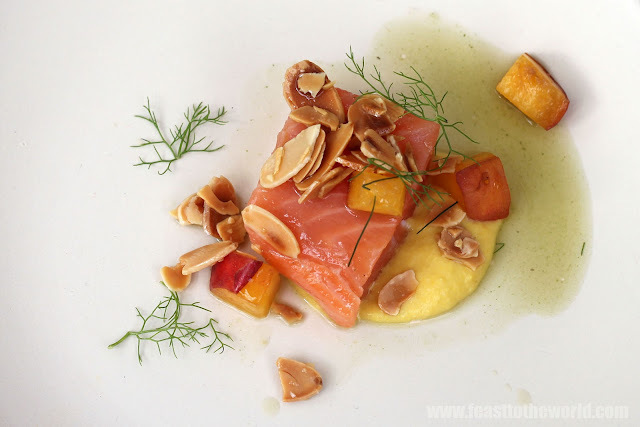 This tantalising start continued with the delicate cured wild salmon that had been gently sous-vide in 50ºC, paired with creamy sweetcorn mash; sweet nectarine (which worked beautifully with the salmon I might add); roasted almond flakes and bronze fennel top along with the inventive gourd juice seasoned with Japanese shiso vinegar. 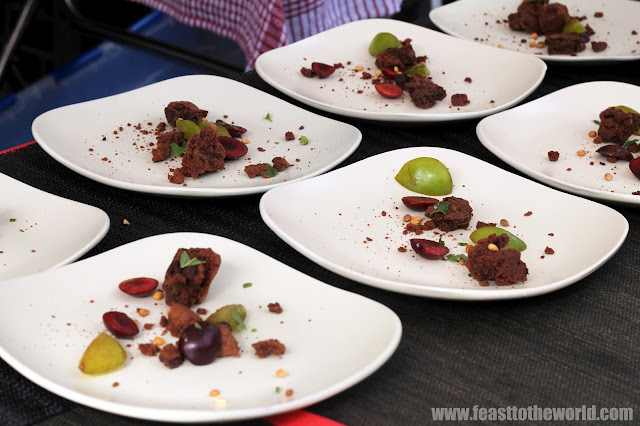 The taste was both delicate and refreshing, each component stood out and worked together in perfect harmony. 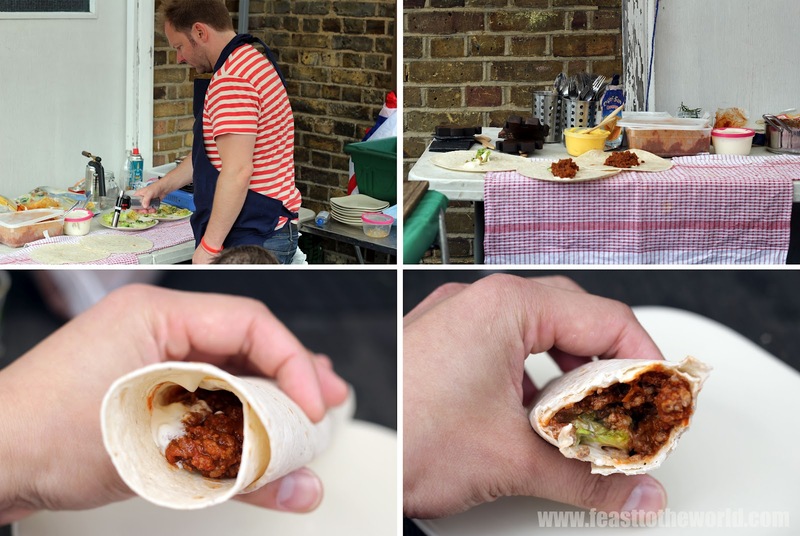 Next up was the humble Angus beef wrap, although not as impressive as the predecessors, was still of a high calibre. 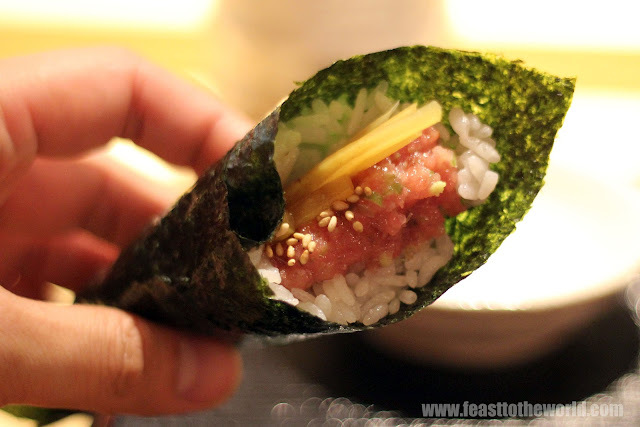 The beef was rich and flavoursome and the blowtorched lettuce harked back to Ben's previous works in Roganic. 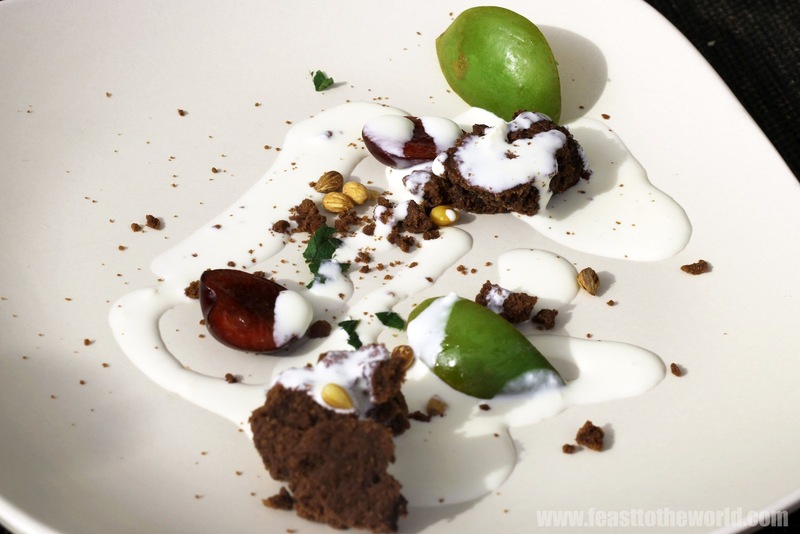 The pudding came in the form of the brownie rocks with a scattered of mahleb seeds, Kentish cherry halves and greengage, along with the unusual combination of aromatic dill puree and lemongrass cream. A moment of silence momentarily overtook the up-till-now buzzing dining premises - a sure sign of enjoyment and appreciation to this delectable treat. As Ben had said it himself, this is ideally what he hope to continue - to introducing a whole new dining experience and to complete that missing link in the otherwise mundane and cold familiar environment of just another restaurant. In doing this, he is also giving diners a chance to enjoy seriously top-notch fine dining in a comfortable setting. And for just £15 per head for these amass of technical advanced cooking, what a bargain. At the time of writing, this has gone up to £17.50 with the promise of even better ingredients sourced which, if you ask me, still cheap as chips! 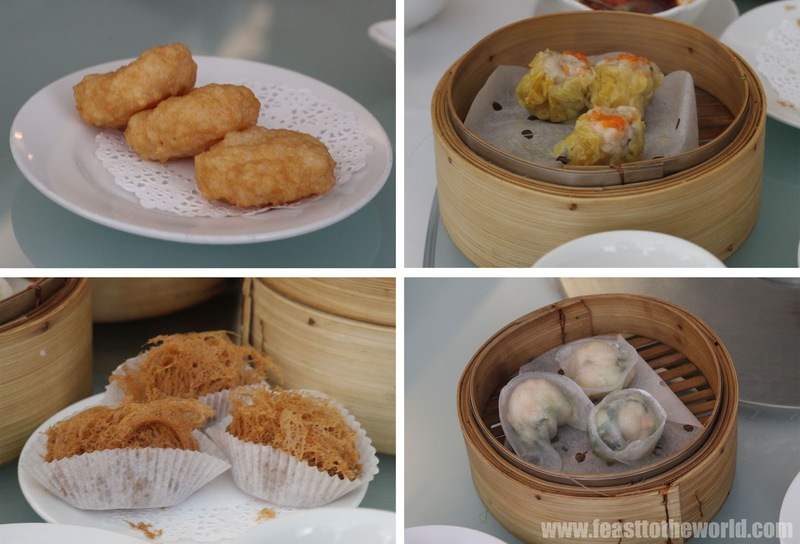 A few weeks ago, someone mentioned Princess Garden on the twittersphere, which I was told, serves some cracking good dim sum. On hearing this, a plan was hatched....to boldly where I have yet to go before....a legendary (well, according to twitter anyway) superb dim sum restaurant. The conversational went on and soon a team of Dim Sum enthusiasts was collated to venture on this Dim Sum outing. So reservation were made and 13, yes all 13 of us descend upon this rather grand restaurant in Mayfair on a quite Sunday afternoon. Located not far away from the Bond Street station is this rather spacious and well lit restaurant with he giant windows allowing abundance of natural light to come through. The decor is decidedly Chinese with wooden cravings and Chinese antique artefacts dotted around the waiting area at the front and throughout the entire dining room. Everything screamed luxurious and the immaculately well-dressed waiting staff further add to this expensive-looking venue. This being a first time visit for most of us, we let Erik and Sung (of Mr Noodles), both seasoned PG Dim Sum enthusiast to pick up the top of the crop for us. So 13 cups of hot tea were order and along with a whole batch of steamed, fried, baked delicious little delights were ordered and soon these began to pile up before our very eyes. And within minutes, we have ordered enough food to feed an entire army. 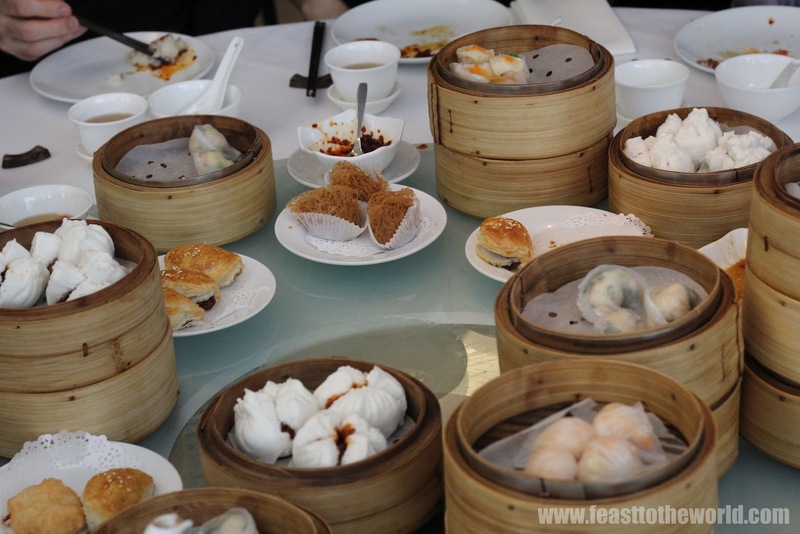 I must say the all steamed dumpling were all very good, the scallops and prawns were delicate, sweet and tender, the Har Gau were definitely better than most that I have had in London and the Siu Mai, which is a favourite dim sum of mine and Cherry (of Feed The Tang), were of a reasonably good standard. Off all the steamed dumplings, the stood out star for me were the more inventive Pak Choi and the Pea Sprouts version. Both greens gave a love subtle sweet crush to the meat filled morsels, both very well seasoned and had a lovely delicate flavours. Quite refreshing on contrast to the rest of the heavy, meat beaded dumplings. The squid cake were decent but don't appeared to have any depth to it but was enjoyable nonetheless. The taro croquette (Wu Kok) were absolutely delicious. It had a well seasoned taro paste and these were encased in some puffy bird-nest liked crust which burst into light, flaky crumbs that just gave the croquette an interesting contrasting texture. 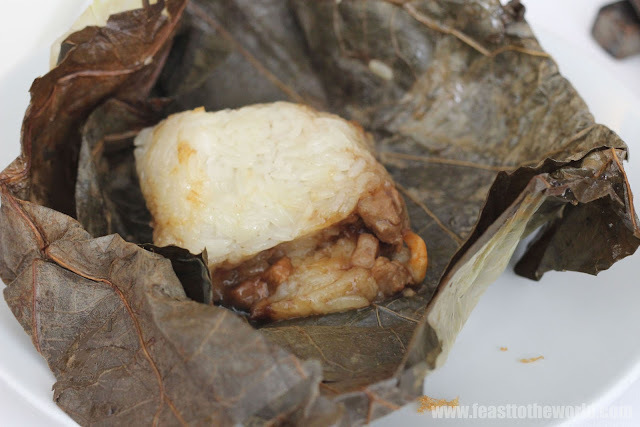 The Lor Mei Kei (glutinous rice in Lotus leaf), which I insisted on ordering were a great disappointment, it was bland and tasteless, definitely something I will never order again from here. Both the Chee Cheung Fun were superb. 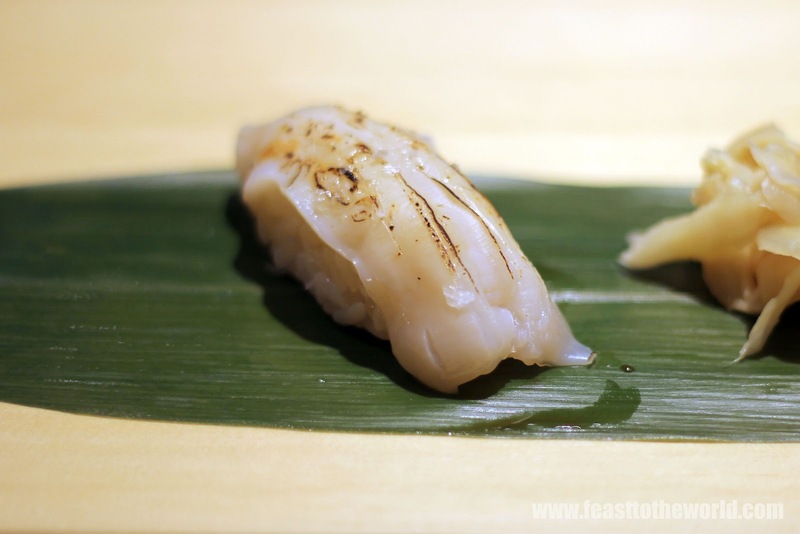 The pan-fried variety had a nice smokiness to it and the spicy XO sauce (made with fried scallop and chillies) added a touch of Umami flavour to the dried shrimp and spring onion rice rolls. And the pièce de résistance was the golden cuttlefish version. 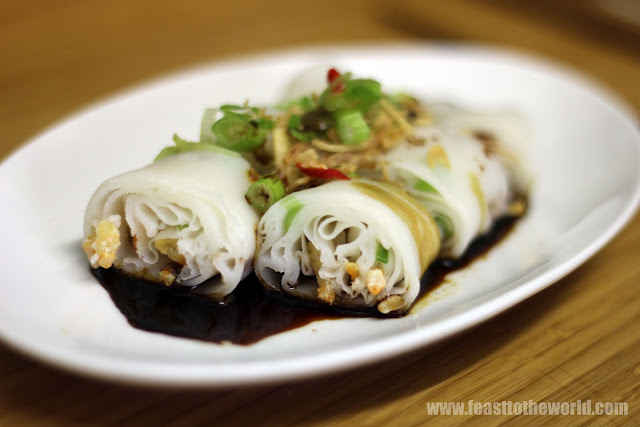 Chopped cuttlefish wrapped in sheets of fu pei (bean curd skins) deep-fried to crispy tenderness and then wrapped in layers of silky smooth thin rice noodle. This is both inventive and superbly executed. 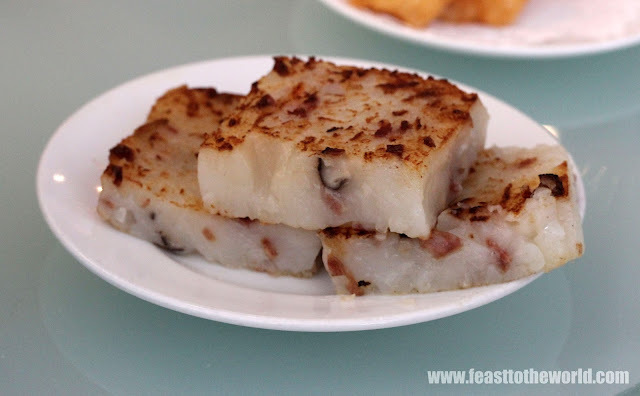 The turnip cake too, were a joy to eat. 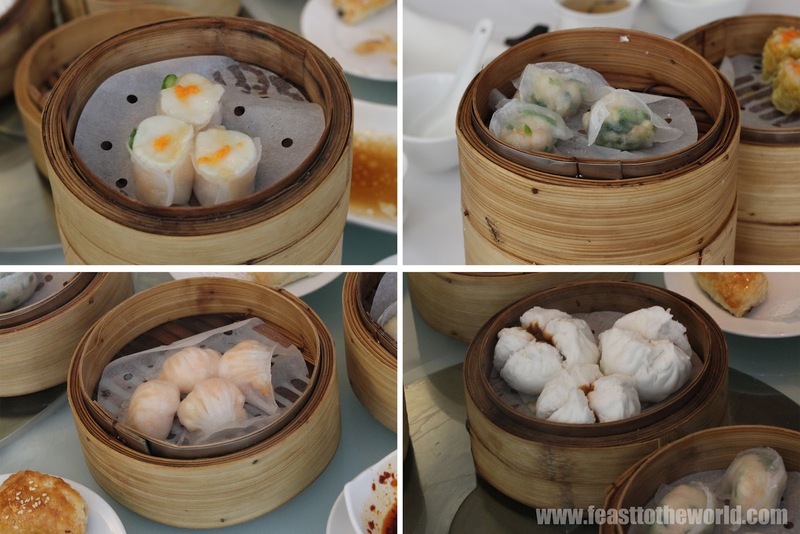 The puddings were slightly weak in comparison to the savoury dishes, which is always the case it seems for any dim sum restaurant. However that said the Bolo Bao (baked pineapple custard bun) were pretty decent, with sweet fragrant filling and light, spongey bun. 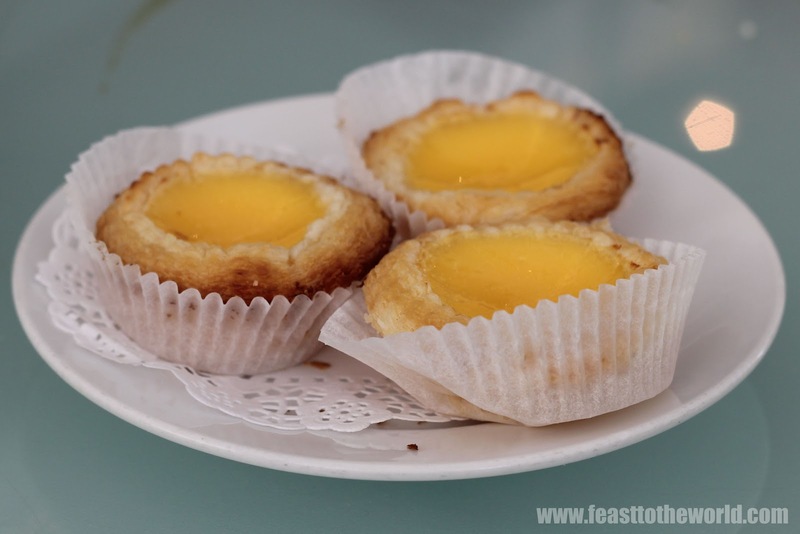 The egg tart were way too flaky and the whole thing disintegrated before it even reaches the mouth and the deep-fried pumpkin, although looked impressive were bland and tasteless. That said, on a whole, this is definitely a good choice to sample delicious Dim Sum and despite its prime and expensive location, the pricing were anything but. We each parted with just under £20 each for the entire feast and judging from the sheer amount of food that we've consumed, this was very decent indeed. 13 might be an unlucky number to most but on this occasion, what a lucky find! 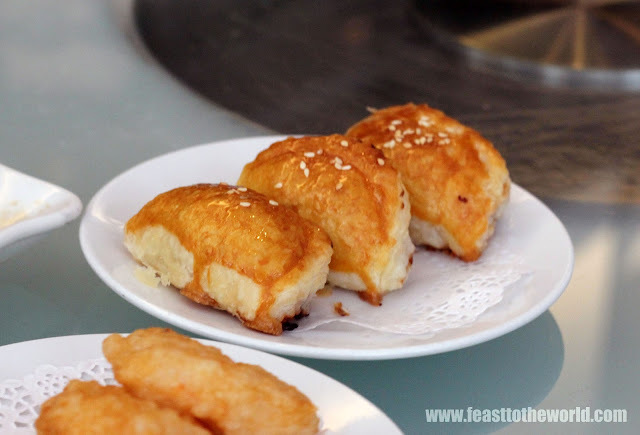 I remember Chee Cheung Fun from my childhood days. It is surprising how very often I would associate a dish with a moment in time. The name Chee Cheung Fun literally means 'pig intestines noodle ', possibly not the most enticing accolation to a dish but this described it perfectly. 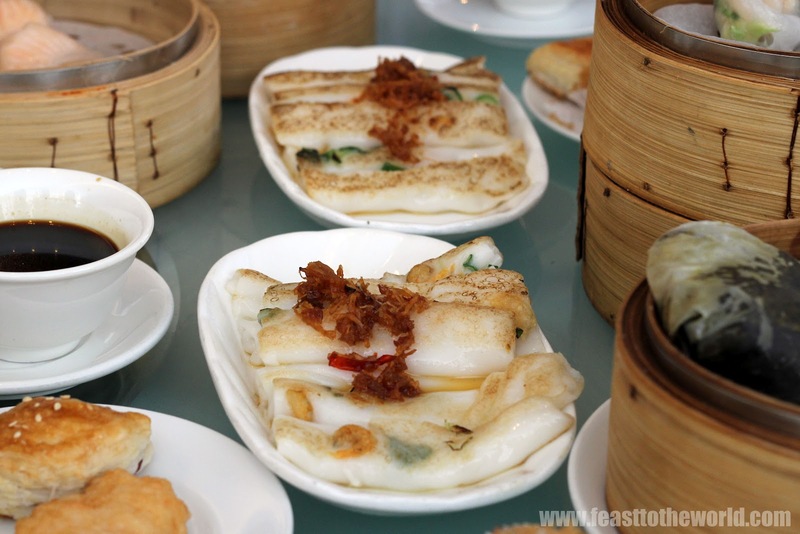 Made from rice flour, steamed and then the thin sheets are rolled to form something that is not dissimilar to the innards of the porky swine. However, do not let the name put you off these delectable snack. The layers of thin rice noodle are often silky smooth and tender, has the most decadent texture and when served with a rich accompanying sweet sauce, is just simply divine. 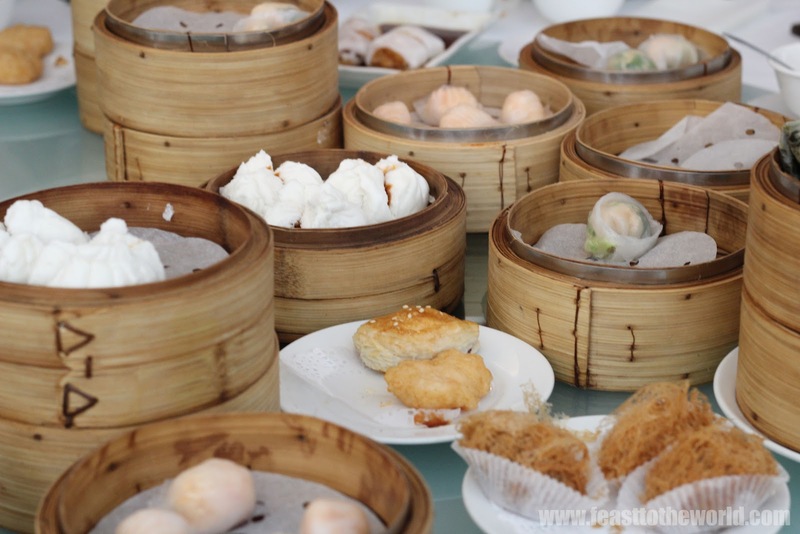 This is also unsurprisingly one of the most popular requests in a Dim Sum restaurant. To be honest with you, what I remembered from as a child was not this Hong Kong-style Chee Cheung Fun but something altogether, rather different. If my memories served me correctly, I was never a fan of this version as to me, it lacked the familiarity of the type found in Ipoh, Malaysia where I often had this dish when spending my school holidays visiting my nan. 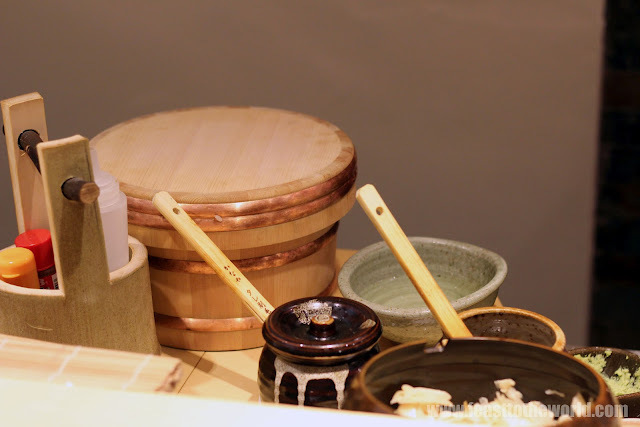 The basic ensemble were the same - rice noodles served with a sweet sauce. But in Ipoh, the freshly steamed Chee Cheung Fun were thinly cut accompanied by a sweet mushroom sauce, chilli sauce, curry gravy with pigskins (gasp! Yes, pigskins!) and topped with pickled green chillies. It was decidedly different but delicious nonetheless. However, instead of attempting to recreate that familiar Ipoh Chee Cheong Fun, I thought I'll be less adventurous and make something easier which is this Hong Kong-style that is commonly found in Singapore hawker centre and many dim sum restaurant. I have used the term 'easier' loosely 'cause this attempt was not without any problems along the way. First of all, I needed a vessel large enough to cook the rice mixture which wasn't easy. This will then have to fit onto the steamer which meant the size can't be too big. I initially tried using a square plate, but that was a fail our as even after lightly greased, the cooked Chee Cheong Fun just refused to peel off the plate. Next, I decided to lined the plate with a cling film (was going to use muslin cloth but I've ran out and believe me, it wasn't the easiest of thing to get hold of) and that didn't helped as once steamed, it shrivelled and unwrapping it became a tedious task in itself, let alone trying to peeled the rice sheet off. So finally, a stroke of genius occurred (didn't realised I had that in me), I decided to use the base of a non-stick cake tin and lord and behold, it worked beautifully. Being a great conductor of heat, it was a tad tricky to spread the rice mixture but with the help of my trusty oven gloves, the problem was solved. 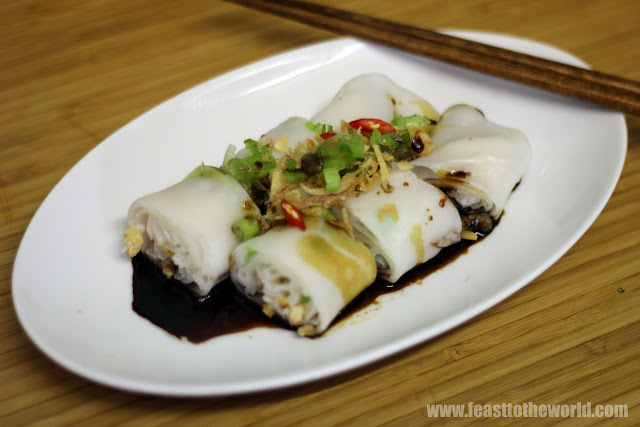 So here's how I made my Chee Cheong Fun if you want to attempt in creating this Cantonese classic. I used hae bee/dried shrimps and spring onions for mine but you can also add Char Siu (Cantonese roast pork) to the fillings as a variation. Otherwise, you can easily find this dish available at any good Dim Sum restaurant near you. To make the sauce, gently mix all the ingredients except for the sesame oil and bring to the boil. Simmer for 5 minutes, until all the brown sugar has dissolved. Allow to cool completely before adding the sesame oil and set aside. 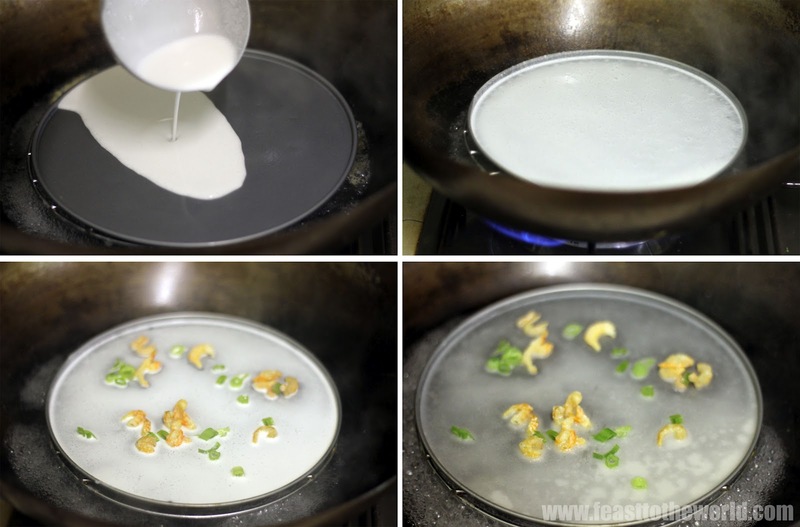 In a large bowl, mix the rice flour, tapioca flour, water, salt and sunflower oil together. Pass through a sieve to remove any lumps and set aside. Prepare the wok or a steamer for steaming. Lightly grease the cake tin base with a brush and steam the empty tin for 1-2 minutes to heat through. Note: I've used a 9in/23cm cake non-stick cake tin with a loose base and use only the base for these. Stir the rice flour mixture to mix well and ladle about 1/3 ladleful of the mixture into the tin base. Tilt the tin base to spread thinly and evenly. Use a kitchen glove for this as the tin is scalding hot. Scatter a small handful of the hae bee/dried shrimps and spring onions over the spread mixture. Note: If making plain version, ignore this step. Cover with a lid and steam for 1- 1/2 minutes, until the mixture turns translucent. 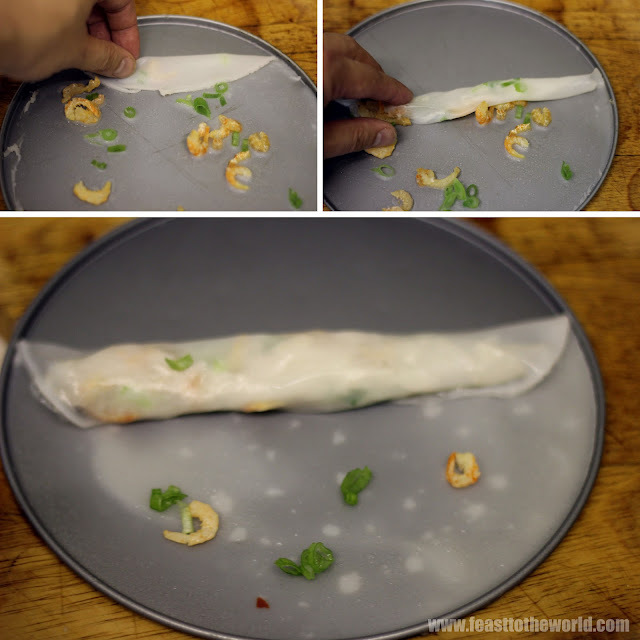 Remove the tin and using a spatula, loosen one end of the cooked chee cheung fun and gently roll over to form a cigar shape. 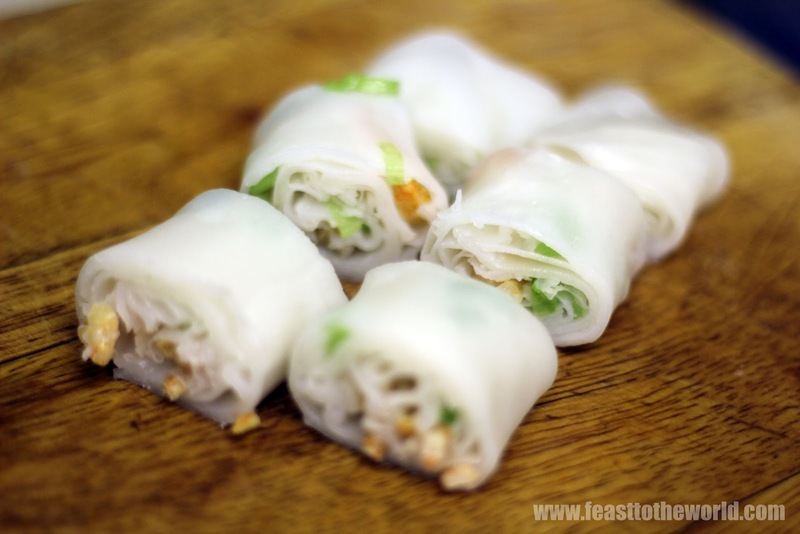 If you find the roll too small, make another layer of cooked chee cheung fun and roll this onto the second layer to double it up for the desired thickness. 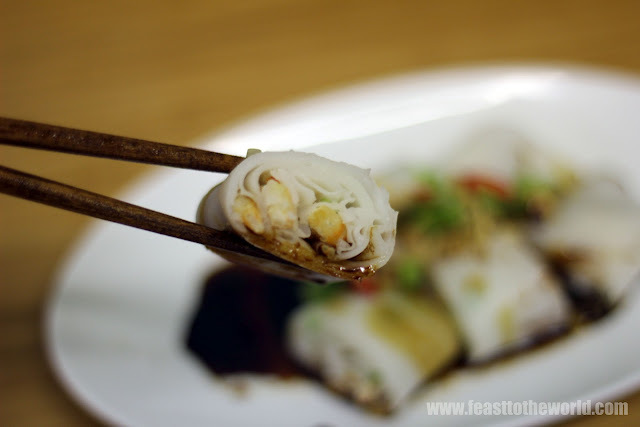 To serve, cut the chee cheung fun into 1in lengths. Place on a plate, sprinkle with the crispy fried shallots and sesame seeds and pour over the sauce. It's taken me a while to write this post, and it also taken me a long time to decide if I ought to share this true hidden gem. But I think Toru-san's skills and dedication should be spread further than amongst the circle of those who's in the know. So it with great pleasure and reluctant, I am posting this. 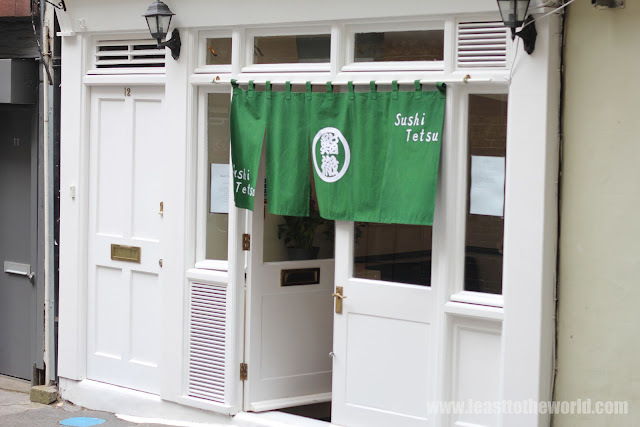 Tucked away in a little back alley, away from the main road of Clerkenwell is a traditional tiny little sushi-ya, run by the chef Toru Takahashi and his wife Harumi. Tiny is perhaps an understatement, it seats only 7 diners by the counter at any given time. There might be 2 tables available as an option for anyone after some privacy but why would you want to miss out on witnessing a display of art form that had taken years to mastered? It is because of this intimate environment, Toru-san was able to pay full attention to all his guests throughout the entire service. 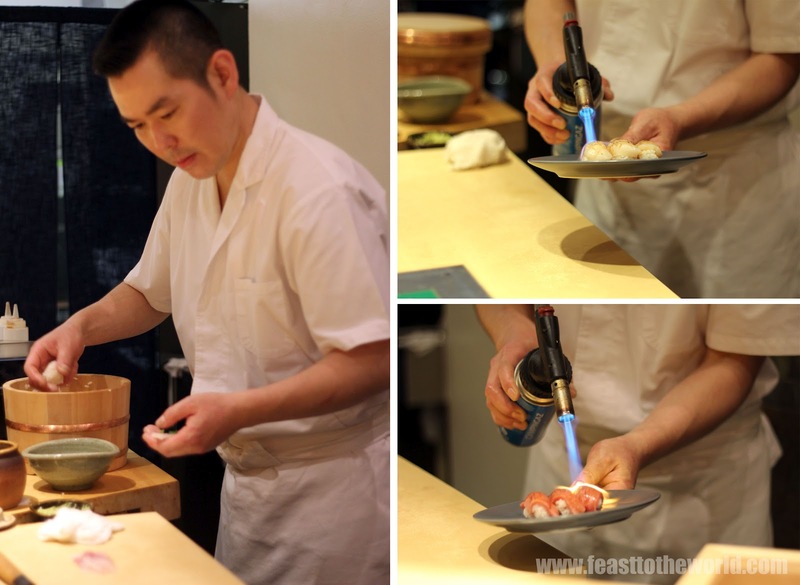 Toru-san started his career as an apprentice in Kobe and had previously worked in Nobu as a sushi chef for 5 years before leaving to set up his own restaurant. 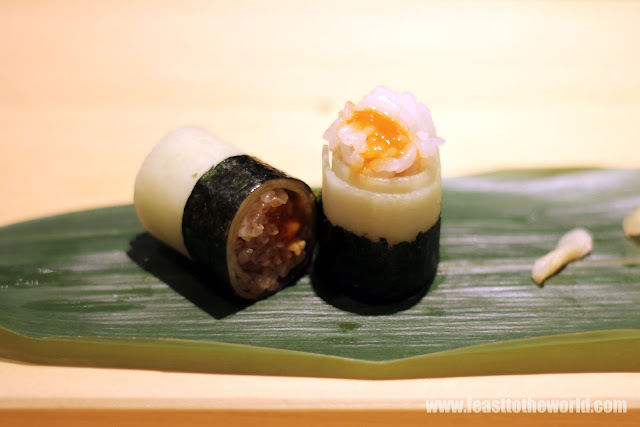 This sushi bar concentrates on only sushi and sashimi and by gosh what a pleasure it was to have such an establishment. All the fish available were freshly picked from Billingsgate Market on the day by a reliable source whom I'm told, 'always picked the good stuff'. On the night that we visited, my friends John, Goz and I decided to ask for the Omasake (up to the chef's recommendation) service. 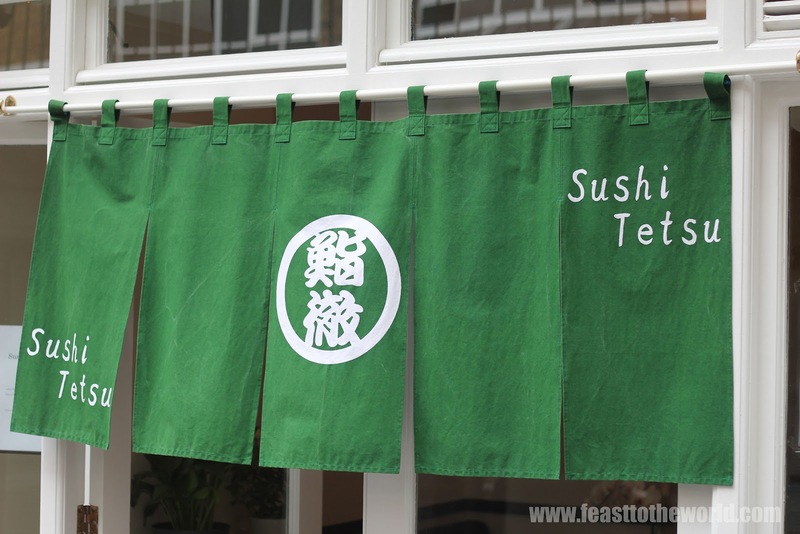 This was by far the best way to enjoy sushi as this allowed the Chef to have full control and served only what he knew was the best and the freshest pickings. Toru-san was brilliant at this and all the sushi that we had on the night were of top-notch quality and superbly prepared. Unlike some sushi chef who would just concentrate on slicing the sashimi and moulding the perfect nigiri sushi, Toru-san was also a born entertainer and a man of great humour. Throughout the service, he was great conversation companion and provided great in-depth information for any queries that we had. His wife, Harumi was just as amiable. The double act was also what marked this out to be just your normal run-of-the-mill sushi restaurant. Constant attention was also being paid to the diners, and any empty Sake glasses would be offered another without any hesitation. The service was absolutely spot-on. All the fish were prepared from behind the counter and the arrays of top quality fillet were kept on display in his wooden box, glistening and shining in its full glory. 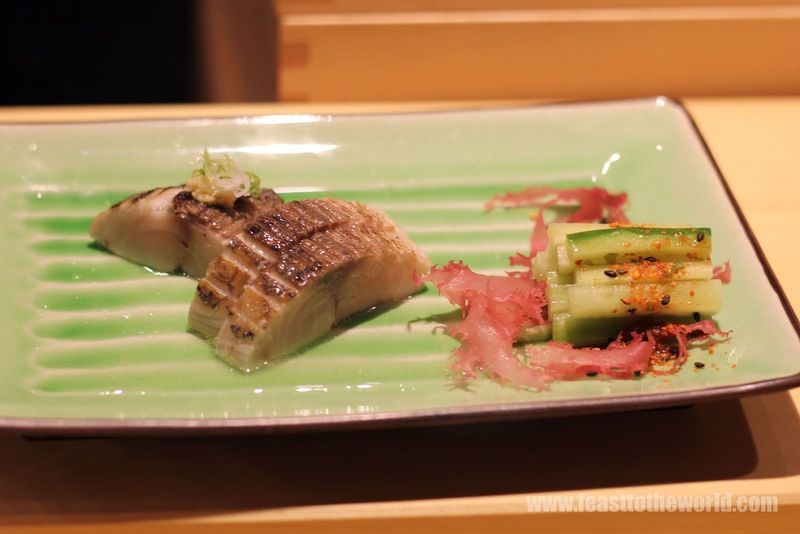 The first of the many dishes was the sea bass sashimi, served with a light ponzu sauce. 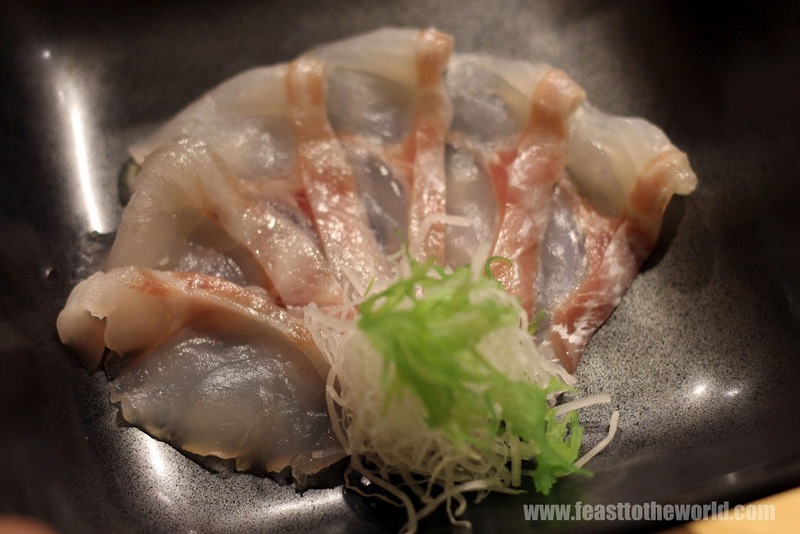 The delicate flavour further emphasised on the freshness and it was a tantalising intro. The mackerel were skinned, lightly scored and then flame-scorched with a blowtorch, giving a sweet charred taste to the clean-tasting fish. This was one of the many appearance of that amazing blowtorch that, in the hand of Toru-san, became a tool of creating many wonders. 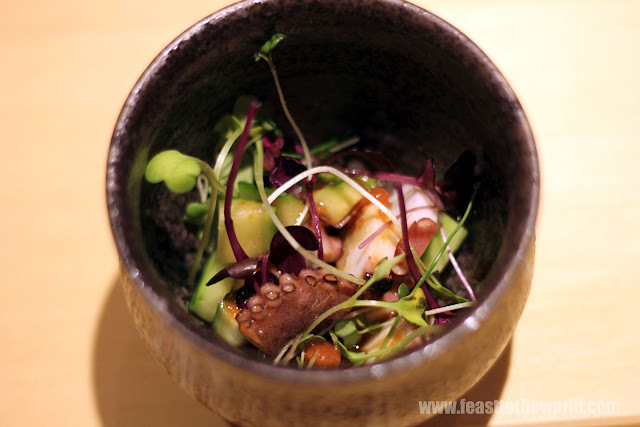 The octopus that had been massaged for 45 minutes before gently boiled and cooked were meltingly tender. 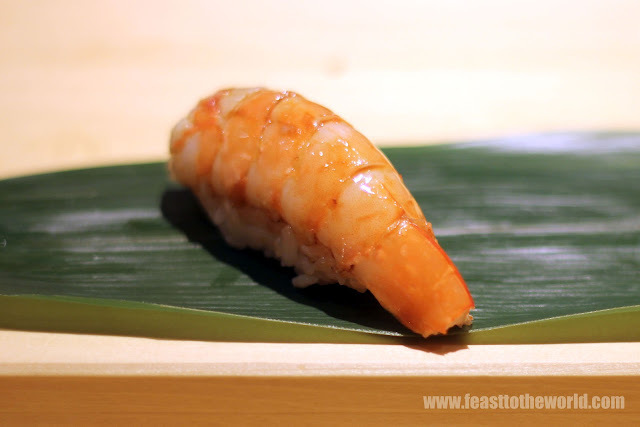 The accompanying plum sauce gave a sweet, sharp and aromatic flavour that is just divine. Once the bowls of octopus were cleared, a clean, damp sheet of bamboo leaf was laid before each of us and these would become our dining vessels for the rest of the evening. 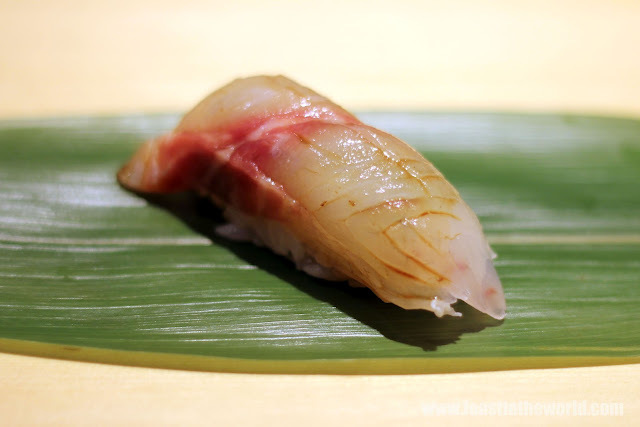 The sea bream were gently brushed with what was decribled by Toru-san as the 'secret' sauce and moulded over a small handful of lightly vinegared sushi rice. The balanced was just right. The sauce was delicately sweet and salty, complimented the sweet sea bream and allowing the quality to shine through. Another beautiful piece of sushi, the squid were lightly scored and once again brushed with that 'secret' sauce, another fine specimen and it just was a revelation to see how soft and meltingly tender squid can be when served this fresh. 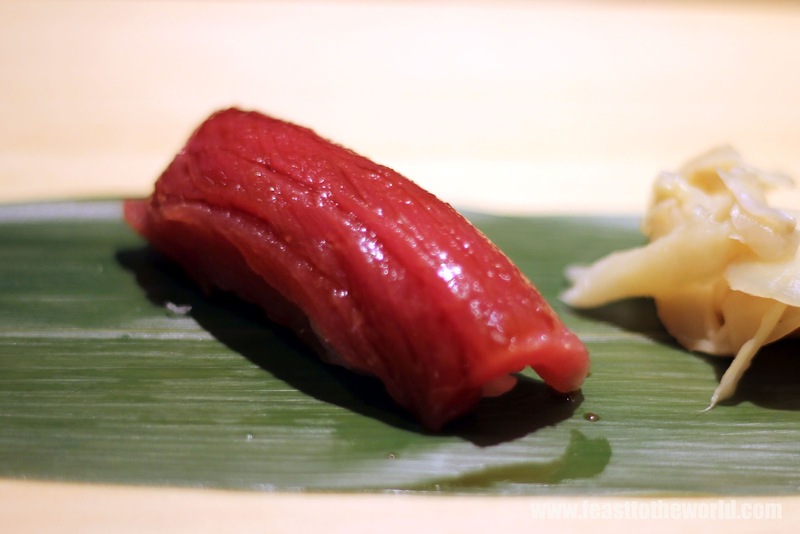 Chu-toro, a medium fat tuna was definitely by far the best sushi that I have ever put into my mouth, with no effort required, it just melted and dissolved like a velvety smooth ice cream. Next was the flame-scorched squid served with a squeeze of lime and a sprinkled of sea salt. This presented a taste completely different to the previous squid sushi. The charred flavour gave an earthy robust taste,offset by the sharpness of the lime and then gave way to the salty flakes. It tickled every taste buds in the short timespan of a few seconds. 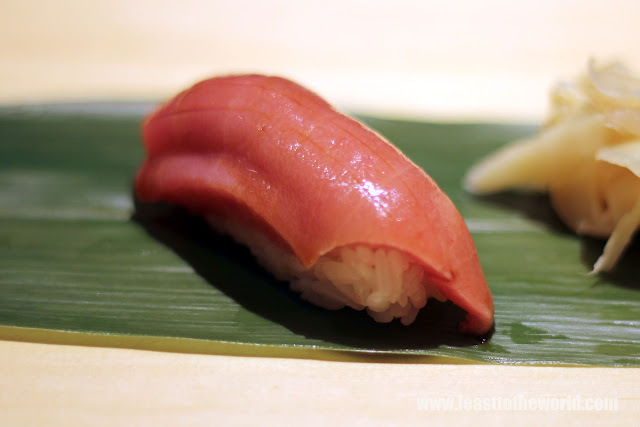 The glorious ruby-red Akami or lean tuna was sweet, juicy and just as tender even without the fattiness. 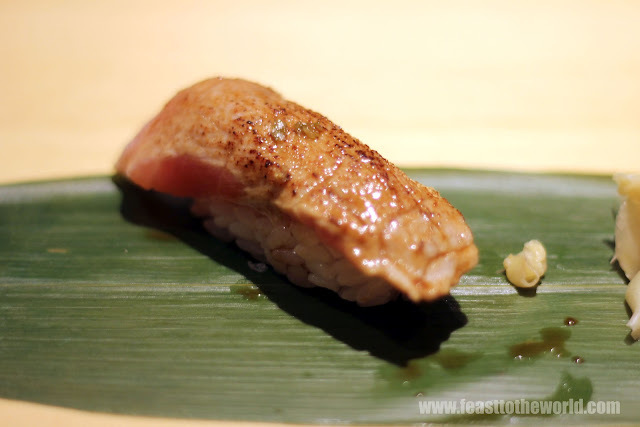 Otoro (tuna belly) was craftily flame-scorched with that wonder tool of his and resulted in a slightly beefy, rich and succulent piece of sushi. Next on the menu was the sardine, so fresh that it smell of nothing but the ocean and tasted wonderful sweet and delicate with hint of saltiness from the adorning flying fish roe. Jumbo prawn was lightly flame-grilled on the belly before moulded onto the rice and brushed with the 'secret' sauce. It was decidedly sweet and has a rather intensive saltiness within. Next came Toru-san's very own creation. 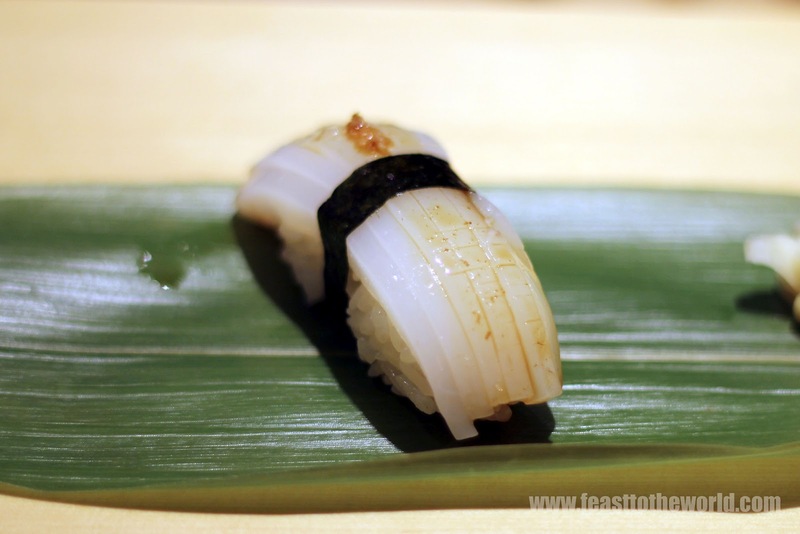 I don't want to give his secrets away so instead of giving you a description, all I can say is that this sea urchin roll was absolutely delicious. 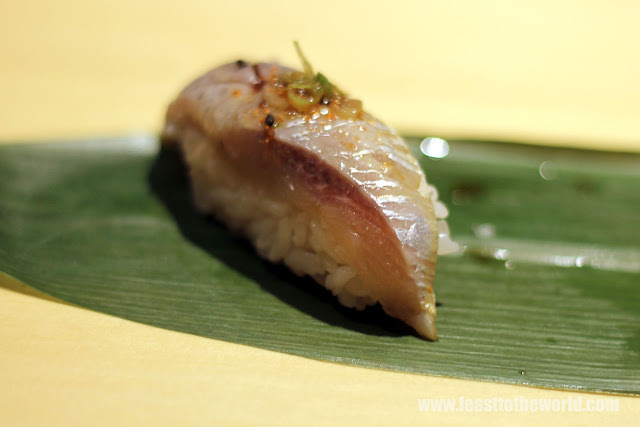 Horse mackerel was done in an inside out style, the cured Saba was sliced open, lined with Shiso leaves and pickled onions and wrapped over some rice. 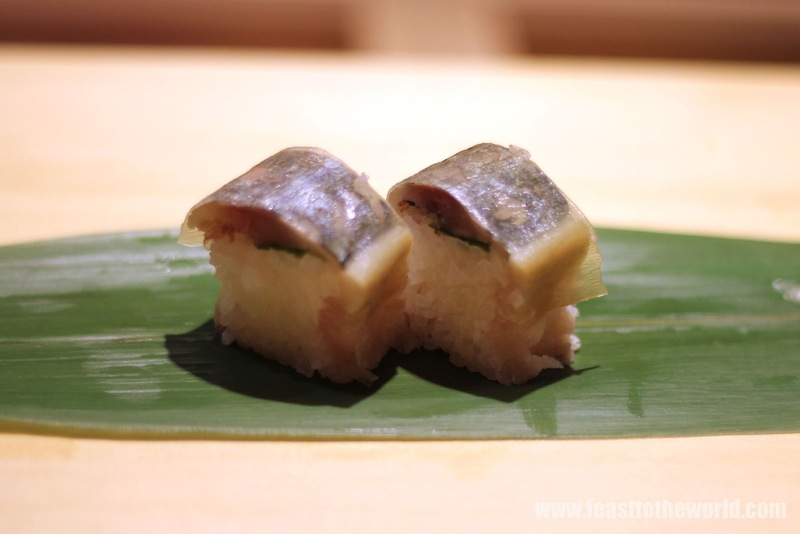 These were then layer with thin kombu sheet and was a delectable mouthful. 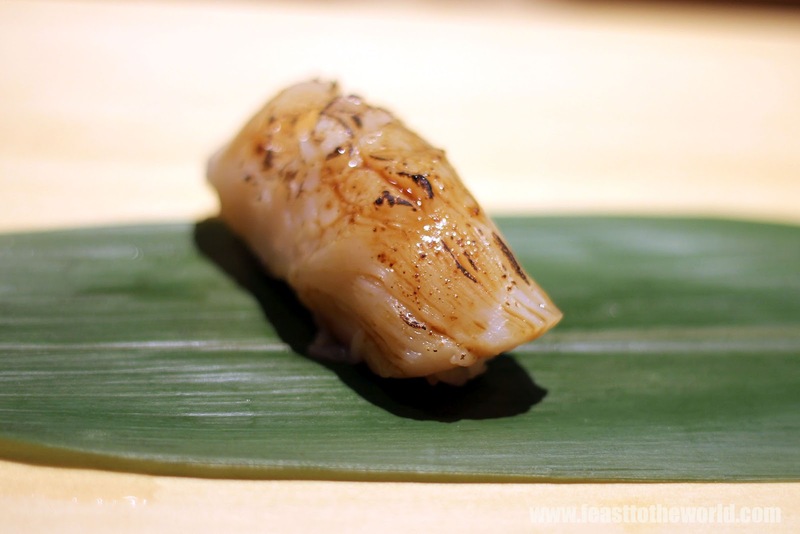 The plump scallop was once again, flame-scorched for that charred sweetness and was another melt-in-the-mouth delight. Last couple of sushi came in the form of the maki (hand-rolled) and temaki (hand-wrapped) sushi. These were not your average joe standard either. Delicate and flavoursome, perfectly balanced by the right amount of rice. 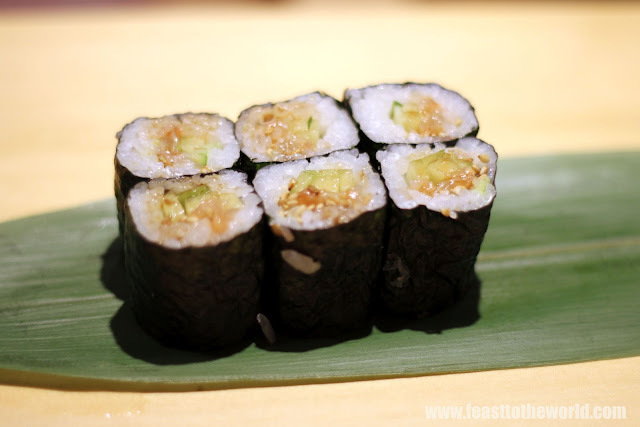 The maki was filled with the Hitate Himo, crunchy scallop mantles and the temaki, with finely chopped chu-toto (medium fat tuna). These were fresh and light and noticeably more superior than any ubiquitous so-called sushi chain. 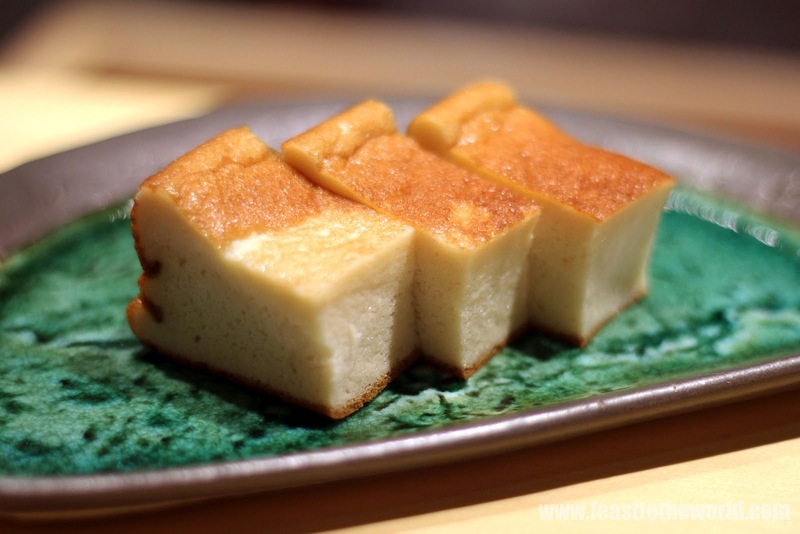 We finished the whole meal with the tamago or egg. The eggs had been whisked, and then mixed with beaten fish paste, crab and many other ingredients. 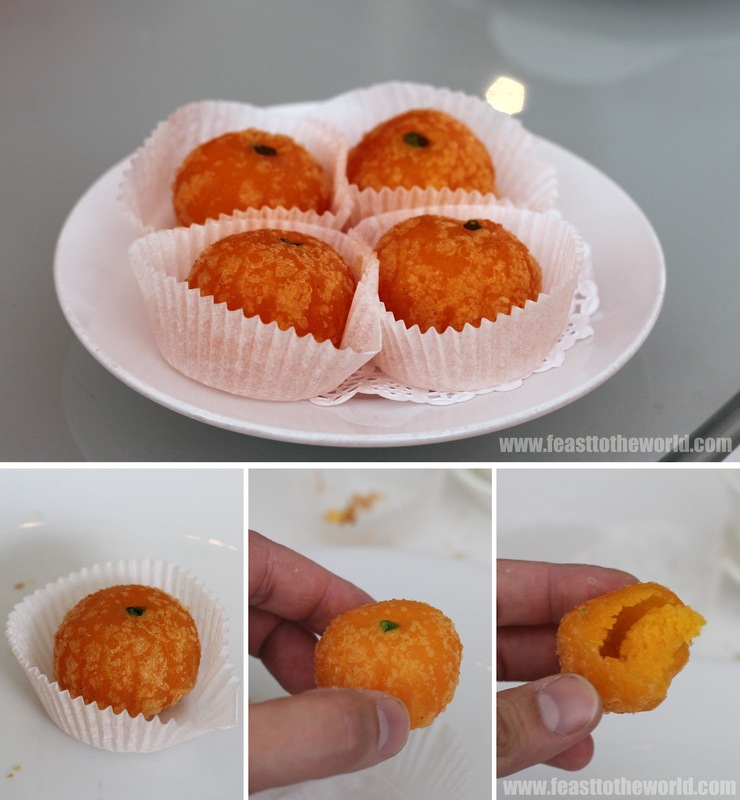 They were fluffy and has a sweet, sponge-like texture. In some way, it's like a savoury cake and just finished the whole meal beautifully. So that conclude my experience in the brilliant sushi restaurant that ideally, I would very much like to keep for myself but that would be selfish of me. On the menu, there were the set menu options starting at £9.80 for a lunch set. This won't be a cheap meal if you do it the Omasake-way but then again, fish of such quality and painstakingly prepared with such skills never will be. So if you are not willing to pay for quality, the better for me as this 7-seater joint is always full so more chances of me getting a seat for a return trip soon.